10% Off plus never forget to order! 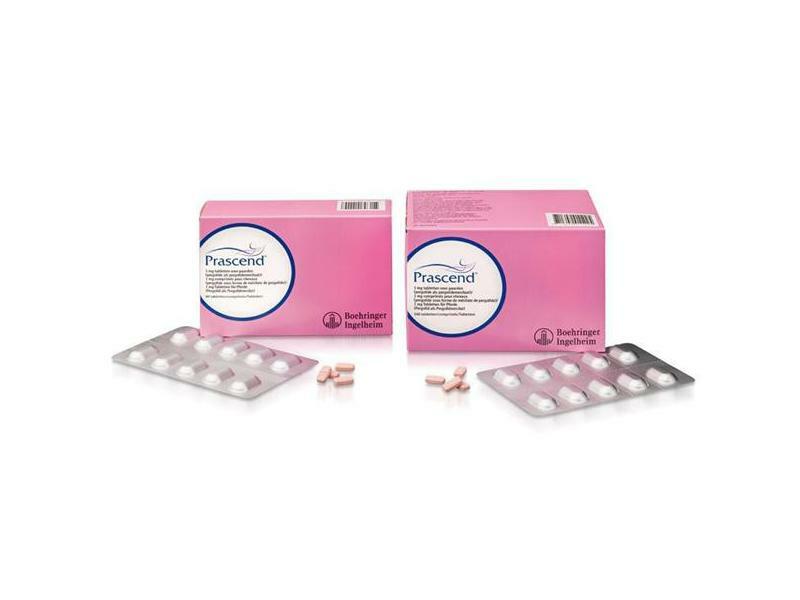 Prascend is supplied as small tablets and is the veterinary licensed form of the drug pergolide, which has been used for some time to treat Cushing's Disease in horses. This is a hormonal disease where the pituitary gland in the brain fails to work properly, resulting in an overproduction of natural steroid hormones in the body. This gives rise to a variety of clinical signs, the most common being a longer, paler and curly coat. Affected horses often appear depressed and lose weight despite seeming to eat more. They often drink and urinate excessively too. Cushing's disease results in a depressed immune system, so parasite infestations and bacterial infections often develop. Cushing's disease is seen most often in older ponies. Vets can perform blood tests to confirm the diagnosis. Prascend is unable to cure Cushing's disease, but it helps to control symptoms and improves the quality of life. Prascend tablets need to be given daily for the rest of the horse's life. Pink, rectangular scored tablet, engraved on one side with the Boehringer Ingelheim logo and the letters “PRD”. The tablets can be divided into equal halves. Each tablet contains 1.0 mg pergolide (as pergolide mesylate 1.31 mg). Symptomatic treatment of clinical signs associated with Pituitary Pars Intermedia Dysfunction (PPID) (Equine Cushing’s Disease) in horses not intended for human consumption. The product should be administered orally, once daily. To facilitate administration, the required daily dose should be placed in a small amount of water and/or mixed with molasses or other sweetener and agitated until dissolved. In this case, the dissolved tablets should be administered with a syringe. The whole amount should be administered immediately. Tablets should not be crushed. Life long treatment is anticipated for this disease. Most horses respond to therapy and are stabilised at an average dose of 2 µg pergolide/kg body weight. Clinical improvement with pergolide is expected within 6 to 12 weeks. Horses may respond clinically at lower or varying doses; it is therefore recommended to titrate to the lowest effective dose per individual based on response to therapy, whether it is effectiveness or signs of intolerance. Some horses may require doses as high as 10 µg pergolide/kg body weight per day. In these rare situations, appropriate additional monitoring is advised. Following initial diagnosis, repeat endocrinologic testing for dose titration and monitoring of treatment at intervals of 4 to 6 weeks until stabilisation or improvement of clinical signs and/or diagnostic testing occurs. Clinical signs are: hirsutism, polyuria, polydipsia, muscle wasting, abnormal fat distribution, chronic infections, laminitis, sweating, etc. The approach to treatment is the dose titration to the lowest effective dose per individual, based on response to therapy, whether it is effectiveness or signs of intolerance. Depending on the severity of the disease, time to treatment response may vary among individuals. If clinical signs or the diagnostic testing have not yet improved at the first 4 to 6 week interval, the total daily dose may be increased by 0.5 mg. In case clinical signs have improved but are not yet normalised, the veterinarian may decide to titrate or not to titrate the dose, considering the individual’s response/tolerance to the dose. In case clinical signs are not adequately controlled (clinical evaluation and/or diagnostic testing) it is recommended to increase the total daily dose by 0.5 mg increments every 4 to 6 weeks until stabilisation occurs and if the drug is tolerated at that dose. If signs of dose intolerance develop, treatment should be stopped for 2-3 days and reinstated at one-half of the previous dose. The total daily dose may then be titrated back up to the desired clinical effect by 0.5 mg increments every 2-4 weeks. If a dose is missed, the next scheduled dose should be administered as prescribed. Following stabilisation, regular clinical assessment and diagnostic testing should be performed every 6 months to monitor treatment and dose. Where there is no apparent response to treatment, the diagnosis should be re-evaluated. Do not use in horses with known hypersensitivity to pergolide mesylate or other ergot derivatives or to any of the excipients. Do not use in horses less than 2 years of age. Appropriate endocrinologic laboratory tests should be conducted as well as evaluation of clinical signs in order to establish a diagnosis of PPID. As the majority of cases of PPID are diagnosed in aged horses, other pathological processes are frequently present. In rare cases inappetence, transient anorexia and lethargy, mild central nervous system signs (e.g. mild depression and mild ataxia), diarrhoea and colic have been observed in horses. In very rare cases sweating has been reported. If signs of dose intolerance develop, treatment should be stopped for 2 to 3 days and reinstated at one-half of the previous dose. The total daily dose may then be titrated back up to the desired clinical effect by 0.5 mg increments every 2 to 4 weeks. Pregnancy: Use only according to the benefit/ risk assessment by the responsible veterinarian. The safety of this product has not been demonstrated in pregnant mares. Laboratory studies in mice and rabbits have not produced any evidence of teratogenic effects. Reduced fertility was seen in mice at a dose of 5.6 mg/kg body weight per day. Lactation: The use is not recommended in lactating horses, in which the safety of this product has not been demonstrated. In mice, reduced body weights and survival rates in the progeny were attributed to the pharmacological inhibition of prolactin secretion resulting in lactation failure. Use with caution if the product is co-administered with other drugs known to affect protein binding. Do not administer concurrently with dopamine antagonists, such as neuroleptics (phenothiazines - e.g. acepromazine), domperidone, or metoclopramide, as these agents may reduce the effectiveness of Pergolide. There is no clinical experience with massive overdose. Not authorised for use in horses intended for human consumption. The horse must have been declared as not intended for human consumption under national horse passport legislation. Not authorised for use in mares producing milk for human consumption. This product may cause eye irritation, an irritating smell, or headache after splitting. Minimise exposure risks when splitting tablets. Tablets should not be crushed. Avoid contact with the eyes and inhalation when handling the tablets. Wash hands after use. People with known hypersensitivity to Pergolide or other ergot derivatives should avoid contact with the veterinary medicinal product and should not administer it. Pregnant or lactating women should wear gloves when administering the product. In case of accidental ingestion, seek medical advice immediately and show the package leaflet or the label to the physician. In case of contact with skin, wash exposed skin with water. In the event of Pergolide exposure to the eye, flush the affected eye immediately with water and get medical advice. For nasal irritation, move to fresh air and seek for medical attention if breathing difficulty develops. Children should not come into contact with the veterinary medicinal product. Accidental ingestion, especially by children, may cause adverse reactions. Keep out of the sight and reach of children. Do not store above 25°C. For animal treatment only. Store the blister in the original carton. Cardboard box containing 60, 100 or 160 tablets in cold-formed nylon/aluminium foil/UPVC. The lidding material is aluminium foil with a vinyl heat seal coating. Not all pack sizes may be marketed. Pergolide is a synthetic ergot derivative and is a potent, long-acting dopamine receptor agonist. Both in vitro and in vivo pharmacological studies have demonstrated the activity of pergolide as a selective dopamine agonist with little or no effect on norepinephrine, epinephrine or serotonin pathways at therapeutic doses. As with other dopamine agonists, pergolide inhibits the release of prolactin. In horses with Pituitary Pars Intermedia Dysfunction (PPID) pergolide exerts its therapeutic effect by stimulating dopamine receptors. Further, in horses with PPID, pergolide has been shown to decrease the plasma levels of ACTH, MSH and other pro-opiomelanocortin peptides. Pharmacokinetic information in the horse is available for oral doses of 2 µg pergolide/kg body weight and 10 µg pergolide/kg body weight. It has been demonstrated that Pergolide is rapidly absorbed with a short time to peak concentration. Peak concentrations (Cmax) following the dose of 10 µg/kg were low and variable with a mean of ~ 4 ng/mL and a mean terminal half life (T1/2) of ~ 6 hours. The median time of peak concentration (Tmax) was ~0.4 hrs and the area under the curve (AUC) was ~ 14 ng*h/ml. The terminal half life in this study was much shorter than reported in humans. This is likely due to the sensitivity of the analytical assay in this study which did not allow for complete elucidation of the concentration - time profile. Therefore the rapid estimated rate of elimination in this study may not be a true reflection of the elimination phase. In a more sensitive analytical assay, plasma concentrations following the dose of 2 µg pergolide/kg were very low and variable with peak concentrations ranging from 138 to 551 pg/ml. The peak concentrations occurred at 1.25 +/- 0.5 hours (Tmax). Plasma concentrations in most horses were quantifiable for only 6 hours post dose. However, one horse had quantifiable concentrations through 24 hours. Terminal half-lives were not calculated as there was incomplete elucidation of the plasma concentration-time curve for most horses. Pergolide mesylate is approximately 90 % associated with plasma proteins in humans and laboratory animals. Below are some recent questions we've received regarding Prascend for Horses, including answers from our team. Can prascend be safely prescribed alongside Bute? My 26 year old needs both! Yes this is perfectly fine, they are often prescribed together. These tablets currently cost £1.04 each. Postage is free if you spend more than £29 at a time (so if you buy 28 tablets or more at one time, postage is free.) If you order from abroad, postage and packing is a flat £10 fee. Yes as long as you send us the prescription, we can ship to Ireland. There is a flat fee of £10 for all medication exports out of the UK though, on top of the cost of the medication.